Yevo Labs might be based in Stockholm, but this does not mean that they are short on ideas. In fact, Sweden is a hotbed of ideas, taking into consideration Ikea and Volvo (alongside Abba) being some of their most famous exports. Yevo’s latest flagship device? The Yevo 1, which is a new generation of smart headphones that has been specially engineered to deliver musical perfection and superior performance thanks to the introduction of Near-Field Magnetic Induction pairing technology. This allows it to remain different from other Bluetooth-connected wireless devices. Slapped with a $249 asking price, the Yevo 1 will offer listeners total freedom of movement without having any kind of wires and top-shelf sound quality, sporting a streamlined aesthetic that is inspired by faceted precious metals and smooth silhouettes. Users of the Yevo 1 will be able to enjoy a synchronized and wire-free HD sound experience, delivered in a sleek, sophisticated manner via Knowles balanced armatures in addition to the latest advancements in audio. Crystal-clear sound quality which has been fine-tuned to hit crisp highs and deep lows, the Yevo 1 arrives wrapped in Rose Gold, Gold and Glossy Black accents, while sporting three colorways to choose from – Jet Black, Ivory White and Onyx Black. 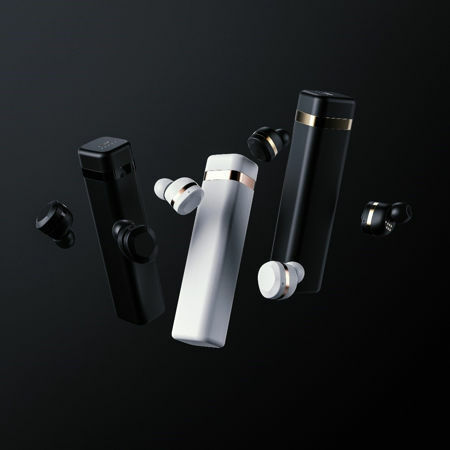 It claims to offer ultimate freedom with Bluetooth 4.1 connectivity as well as Near-Field Magnetic Induction (NFMI) pairing for secure connectivity, while Passive Noise Cancellation offers a level of privacy when listening. Of course, you can always opt to listen to what the world offers with a tap, and that will activate the innovative Audio Transparency feature, enabling users to hear and react to their surroundings so that they can avoid obstacles and the like. Touch sensor technology coupled will accompany three built-in microphones, transforming functional elements into distinctive design features. The Yevo 1 touts of delivering up to 20 hours of battery life on a full charge, and each purchase will arrive with a sleek storage case that doubles up as a portable charger, since it can hold up to five extra charges.